I was able to copy over all of the many translations from my original MOD, but I had to add some additional text so please let me know if you can translate those additional lines. 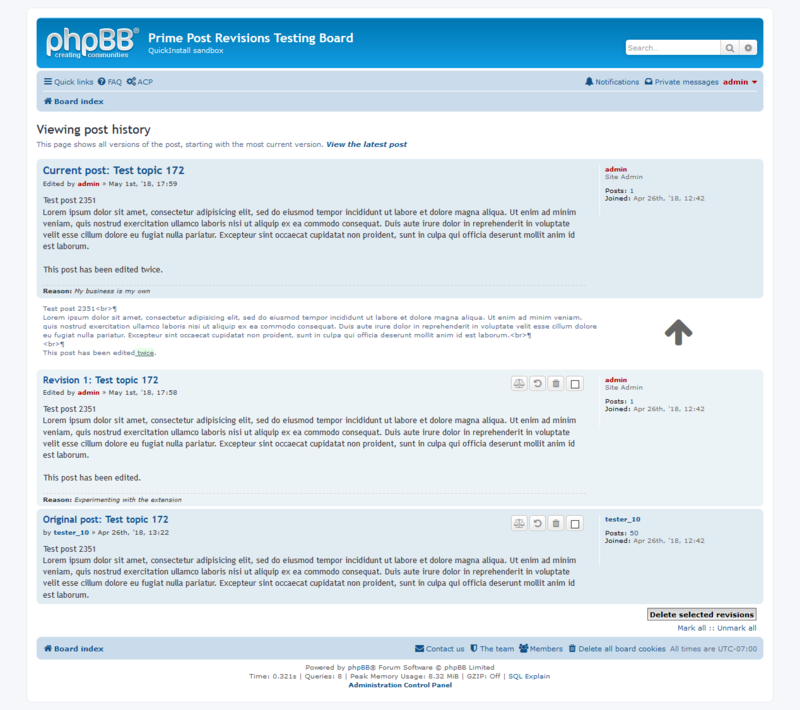 A phpBB 3.2 extension that keeps a revision history of all posts edits. These revisions can be viewed, deleted, and restored only by users with the necessary permissions. Last edited by primehalo on Tue Jun 05, 2018 10:12 pm, edited 1 time in total. What's the difference to this extension: viewtopic.php?f=456&t=2450106 (which is a fork of this extension: viewtopic.php?f=501&t=2354286 )? The forks are only a simple converting from the mod. This one we can see on the pics, goes beyond a simple convertion. Seems way better then the mod version. The question should be, will it be better then this one? I had looked over those after I had started working on my conversion but didn't end up using any of the code. Mine is more efficient, does more error checking, keeps better track of edit info (editor, time, and count which the board doesn't update on every edit), has more permissions (local and global moderator, and local forum) for better control (of who can see, change, and delete edits), allows deletion of multiple revisions at a time, will show comparisons between the edits when hitting a button, allows you to add/change the edit reason when restoring a post, allows you to turn it on and off for each forum, and has cron job that can auto-prune old posts. I had not downloaded or looked over that extension. If anyone has, what features does it have that you would like? I'll compare and get back to you Since I didnt test it yet yours. But for what you explained now, I'm pretty sure its more complete and better then the one I talked about. In any case I'll check it personally. So it would be great if by default it would activate it for all foruns, or at least add a note on the topic so we would know how to edit the extension so it would enable by default, since its more useful for big foruns. Possible feature: It would be great to been able to see the code like an quick edit button that will provide a quick way to get access to the code without being able to really editing the revision, but it could be handy to have access to the code. 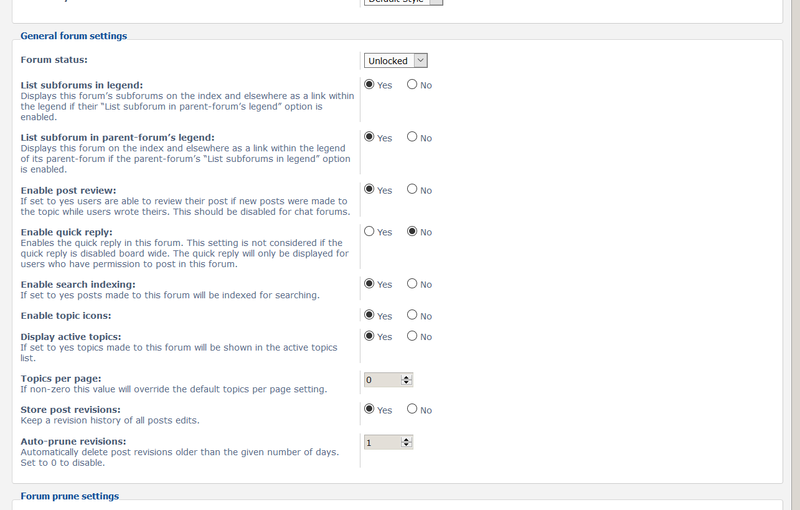 I just tried installing it again fresh and it worked, it was enabled by default for all forums and I was able to change the options. 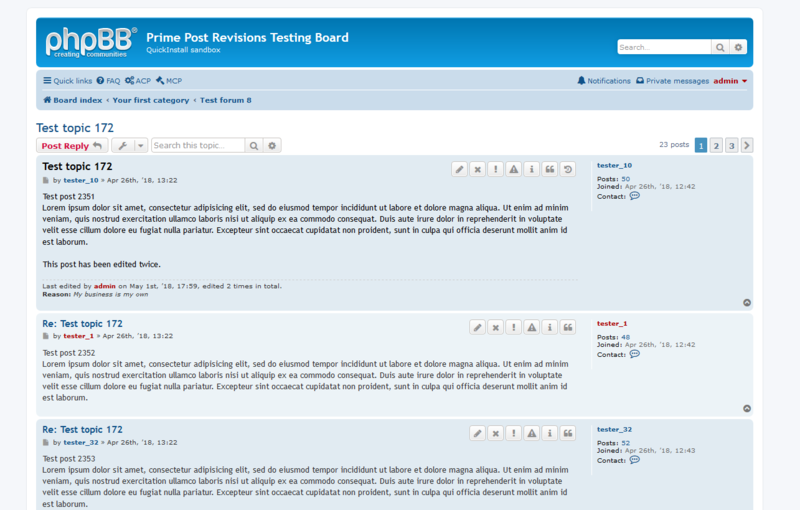 Can you check your database and see if those columns were added to the forums table? Interesting idea, but for now I'd like to get it tested and make sure everything is working before adding such a feature. Yup, it was not well uploaded. 1 file missing lol. Thanks for letting me know about this bug. I have fixed it and released v1.0.0 beta 3. That bug got introduced in my last update when I forgot to set the auto-increment. I've released v1.0.0 beta 4 which fixes it.